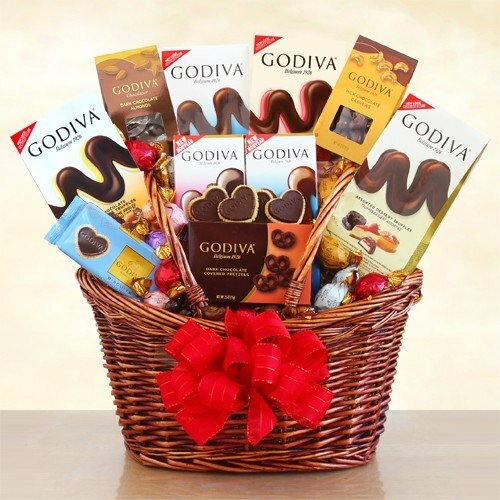 Send holiday wishes in a grand way with a beautiful gift basket filled with Godiva chocolate! Indulge their sweet tooth with Godiva milk chocolate and salted caramel bar, dark chocolate covered almonds, a Godiva solid milk chocolate and dark chocolate bar, chocolate covered pretzels, Godiva signature biscuits, milk chocolate covered cashews, milk chocolate truffles, a milk chocolate and strawberry bar, a bag of dark French vanilla truffles, a bag of dark chocolate caramels and a bag of white chocolate truffles. All Godiva and all exquisite! We deliver your best Season's Greetings with this beautiful gift basket filled with Godiva chocolate! Godiva milk chocolate and salted caramel bar, a dark chocolate covered almonds, a Godiva solid milk chocolate and dark chocolate bar, chocolate covered pretzels, Godiva signature biscuits, milk chocolate covered cashews, milk chocolate truffles, a milk chocolate and strawberry bar, a bag of dark French vanilla truffles, a bag of dark chocolate caramels and a bag of white chocolate truffles.